Meet at the Welcome Hut, the shade structure outside the fence near the front entrance of the Idaho Botanical Gardens at 2355 N Old Penitentiary Rd., and hop on the artBus! A visit to Gem Center for the Arts "Lounge at the End of the Universe" including admission to "2417," an immersive art experience and a tour of galleries featuring ceramists and the exhibition "Familial Bodies." Surel's Place resident artist Matthew Gray Palmer's "Alluvium: Sifting in the sandbox of selfhood." Last stop, MING Studios' photography exhibition "Lay of the Land" featuring Laurie Blakeslee, Jan Boles, John Francis, John Shinn, Carrie Quinney, and New Catalogue (Jonathan Sadler and Luke Batten). Food and drinks will be provided along the way! ROOT Magazine, created by Emily Senkosky, launches in Boise with a 'Treefort' themed issue highlighting what the festival brings out of the City of Trees. ROOTS Magazine supports and showcases the work of local creatives in order to share the discovery of expression. John Shinn will discuss the influence cinema, genre, and landscape have had on his practice. The presentation will survey past and current projects, including: photographic series, exhibition images, and short films. Shinn lives and works in Boise, ID. He graduated from Boise State University with a degree in Communication, Media Production, and Visual Art. John Francis will talk about images from a body of work that were the result of a photographic journey that began during a 120-minute train ride from Nagoya to Matsumoto, Japan and continued through the Summer of 2018. John Francis is a photographer who resides in Boise, Idaho. Francis predominantly photographs landscapes and has incorporated the effect of motion into his landscape photography. Using motion as a creative tool for his photography began in Japan in 2009 and became the basis of an ongoing project that includes images from Boise, Idaho. John has had solo exhibitions in Japan, Germany and the U.S.A., and his work has been shown in numerous national and international exhibitions. Growing up analog and adapting to a digital world as an adult and emerging artist, Carrie Quinney identifies as a "bridge person", a term video artist Ryan Trecartin has used to describe those who've come of age during the transition from print and television to a world saturated with digital imagery on screens. From digital video projections to iPhone displays, stock photographs, pixels and .gifs, Quinney will discuss her experimentation with all types of digital imagery and displays in order to interrogate the quality, nature, and purpose of the images we see every day, and how these images affect perception and communication in the digital era. Carrie Quinney received a MFA from Boise State University in 2018. She lives and works in Boise, Idaho. With the gracious help of Boise City Department of Arts and History, we will be presenting a multimedia performance project featuring film, dance, and live musical performance. The piece explores the relationships between technology and nature, as well as the creation and destruction of art. The somatic embodiment and building of these art pieces, along with their destruction, is manipulated by the artists and modern technology. Layers of disparate yet interlocking rhythms and limbs, airy melodies, and lush textures phase through each other, creating a dense, flowing environment in which the performers and audience will move through. The innovative scope of this event illuminates the contemporary culture that seeks to further push the artistic boundaries that exist in Boise. The performance will emphasize the importance of using different artistic mediums in a collaborative setting to create a haunting and beautiful portrait of humanity. This year, Storyfort at Treefort Music Festival will be hosting a team regional slam! To help decide which 4 poets will represent our fair city of trees at the regional, there will be a grand slam on Friday, January 25 at MING Studios. 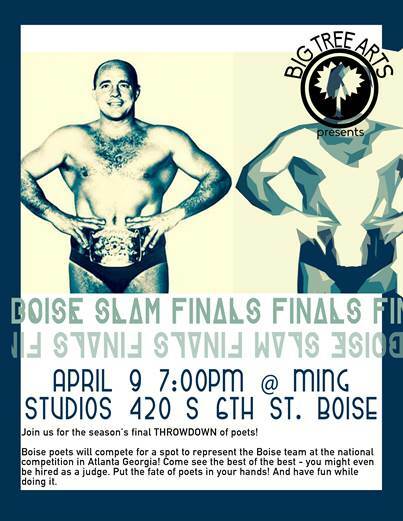 Come watch 8 of the best poets in Boise duke it out for a spot on the team! Born in 1946, Tom Pickard grew up in the working-class suburbs of Newcastle upon Tyne, England. He is the author of more than a dozen books, including Fiends Fell (Flood Editions, 2017), Winter Migrants (Carcanet, 2016), Ballad of Jamie Allan (Flood Editions, 2007), and The Dark Months of May (Flood Editions, 2004). In addition to his poetry, he has compiled several books of oral history, Jarrow March (Allison & Busby, 1981) and We Make Ships (Secker & Warbourgh, 1989). He has also directed and produced a number of documentary films for British television on the subject of shipbuilding and “work,” as well as a film on Roy Fisher, Birmingham’s What I Think With. Sandra Simonds is the author of six books of poetry: Orlando, (Wave Books, 2018), Further Problems with Pleasure, winner of the 2015 Akron Poetry Prize from the University of Akron Press, Steal It Back (Saturnalia Books, 2015), The Sonnets (Bloof Books, 2014), Mother Was a Tragic Girl (Cleveland State University Poetry Center, 2012), and Warsaw Bikini (Bloof Books, 2009). Her poems have been published in the New York Times, the Best American Poetry 2015 and 2014 and have appeared in many literary journals, including Poetry, the American Poetry Review, the Chicago Review, Granta, Boston Review, Ploughshares, Fence, Court Green, and Lana Turner. In 2013, she won a Readers’ Choice Award for her sonnet “Red Wand,” which was published on Poets.org, the Academy of American Poets website. She lives in Tallahassee, Florida and is an Associate professor of English and Humanities at Thomas University in Thomasville, Georgia. No-No Boy is a multimedia concert performed by Julian Saporiti and Erin Aoyama. Taking inspiration from interviews with World War II Japanese Incarceration camp survivors, his own family’s history living through the Vietnam War, and many other stories of Asian American experience, Saporiti has transformed his doctoral research at Brown University into folk songs in an effort to bring these stories to a broader audience. Alongside Aoyama, a fellow PhD student at Brown whose family was incarcerated at one of the 10 Japanese American concentration camps, No-No Boy aims to shine a light on experiences that have remained largely hidden in the American consciousness. A poetry reading given by Sara Nicholson and Chris Violet. Sara Nicholson and Chris Violet Eaton are both graduates from the Iowa Writers' Workshop. They are married and live in Arkansas. Sara's books The Living Method and What the Lyric is are both from The Song Cave. Chris's work includes Some Habits (Omnidawn) and Quartet (Ahsahta). who just wants to meet another nice person? Wanna know what it would look like if an artist came up with an antidote to cruise-y bar scenes and soulless dating apps? "Aw, I do want love, but I'm too old." This structured, participatory event is all about connection. It's fun. And surprising. And weird! And real. People come not to judge or be judged. They come to connect -- meaningfully and genuinely. A conversation with two anti nuclear activists. A conversation between two anti nuclear activists who have been protesting the existence of nuclear weapons, nuclear power and battling the movement of nuclear waste across state lines for decades. Beatrice Brailsford: The Snake River Alliance, Idaho Chuck David: The Rocky Flats Truth Force, Colorado. Beatrice Brailsford and allies resourcefully tracked trains coming from the eastern United States carrying heavy casks full of the Navy’s Nuclear Waste. They waited on the Benton Street Overpass in Pocatello, Idaho bearing witness to trains headed for storage at the Idaho National Laboratory. Brailsford joined the Snake River Alliance staff in 1989, participated in countless anti nuclear actions and is currently the Nuclear Programs Director for the Snake River Alliance. Chuck David is a member of the Rocky Flats Truth Force, a grass-roots non-violent anti-nuclear group formed during protests at the Rocky Flats Nuclear Weapons Plant in Colorado during the late 1970’s. Known for blocking the tracks in and out of the weapons plant the group was successful in shutting it down and infamous for their protests on the tracks at other nuclear sites across the U.S.
Boise State Professor Mitch Wieland will read from his new novel set in Japan in the aftermath of Fukushima Daiichi. Excerpts from the novel have appeared in The Missouri Review, and received grants from the National Endowment for the Arts, the Christopher Isherwood Foundation, the Idaho Commission on the Arts, and the Boise State Arts and Humanities Institute. Join Beatrice Brailsford of the Snake River Alliance on Sept. 6th, 7pm at MING studios for an in depth look at our radioactive backyard. After many years of gross mismanagement of its radioactive nuclear waste, the Idaho National Laboratory (INL) has spent the last 25 years and more than 9 billion dollars engaged in a process of "cleaning up" its mistakes, including more than 5 million cubic feet of plutonium contaminated waste that was buried in unlined pits, directly above the Snake River Aquifer. Beatrice Brailsford was one of the activists there at the beginning and she has been following the clean-up process ever since. She will bring us up to date on the latest from the site and the continuing challenges presented by these incredibly toxic and volatile substances. She will address the present political climate in regard to the problem of "spent" fuel and the very real threat of Idaho becoming a de facto storage site for 1000's of metric tons of highly radioactive waste. MING Studios - Surel's Place - The James Castle House, an evening of exploration visiting Boise's artist in residency programs. The tour will begin at the Idaho Botanical Garden where we will visit with MING's resident, Korean artist Han Seok Hyun and preview the sculpture he is installing entitled "Reverse-Rebirth." Next a stop at MING Studios for refreshments, small-bites, and a chance to explore the studio. Then off to Surel's Place to meet artist-in-residence Sandra Luckett, visiting from Arkansas,and preview her installation "Annihilation and Regeneration.'' We will also have the opportunity to visit former Artist-in-Residence from Washington Clarissa Callesen's "Fertile Remnants" alongside more drinks and nibbles. Next up, The James Castle House's inaugural resident Keiran Brennan Hinton, a Toronto-born artist based out of New York. You will get a special behind-the-scenes tour of the artist's studio and work-in-progress for his upcoming show “Standing Still.” Back on the bus to the Idaho Botanical Garden, but we will be using transit time between venues for artist presentations and insights from the program coordinators of all three residencies. The bus is generously sponsored by Boise City Parks & Recreation. Current artist-in-residence Han Seok Hyun will speak about his previous work, as well as, his current work in progress in Boise. Over the last few weeks Han has been working on his large scale, permanent sculpture, entitled Reverse-Rebirth at Idaho Botanical Garden. Come meet the artist and learn more about his work. Alek de Dóchas will speak on the progression of their research, the culmination of their thesis, sociopolitical & philosophical hypotheses, and how these elements translate into their studio practice. Alek de Dóchas, based out of Boise, ID and Portland, OR works in a combination of ceramic sculpture, video, performance, and installation. De Dóchas attended Pacific Northwest College of Art and Boise State University, graduating with a BFA in Visual Art. De Dóchas' current studio practice explores eco-philosophies and environmental issues as well as their own intersectional identity as a queer brown artist in the United States. Learn the miniature embroidery technique of the indigenous Mazahua of Mexico. Mother & daughter, Enriqueta Calixtro & Dulce Cenobio, are the 2018 World Village Fest Artists in Residence. The embroidery technique that Enriqueta & Dulce use is done with two needles, as they simultaneously work with two different tones of thread. Most of the designs come from the patterns that the family has created over generations. Sumi Ink Workshop by PRIME & Screening of "Dark Progressivism"
Don't miss this opportunity to work with legendary LA Graffiti artist, Jose "PRIME" Reza. PRIME is in Boise for a limited time, currently in-residence at MING Studios. In this workshop, you will learn PRIME's innovative, stylized technique for painting with Sumi ink, which translates the ancient medium of Sumi ink through contemporary gestures. Using brushes to manipulate ink, PRIME will demonstrate his personal approach to graffiti lettering, and give participants the chance to try their hand at the craft. Workshop fee covers all materials. Can beauty be found buried behind concrete and steel, veiled from the rest of society? College of Southern Idaho instructor Shane Brown and Project Flux director Lydia Sakolsky-Basquill venture into the Idaho State Penitentiary to teach creative writing workshops to inmates. Explore how the introduction of creativity and artistic expression will affect the lives of these men fettered by iron bars and the deeds of their pasts. The works the inmates create—poetry, scripts, memoirs, short stories—will be displayed and translated into choreography performed by Project Flux Dance. Writers Abraham Smith and Scott Mc Waters will be presenting selections from their recently published book, 'Tuscaloosa Kills' (Sporkpress, Spring 2018). Abraham Smith is the author of four poetry collections: Ashagalomancy (Action Books, 2015); Only Jesus Could Icefish in Summer (Action Books, 2014); Hank (Action Books, 2010); and Whim Man Mammon (Action Books, 2007). In 2015, he released Hick Poetics (Lost Roads Press), a co-edited anthology of contemporary rural American poetry and related essays. His creative work has been recognized with fellowships from the Fine Arts Work Center, Provincetown, MA, and the Alabama State Council on the Arts. Presently, he is at work upon a poetry manuscript about cranes--birds whose song and stature electrify him. Destruction of Man (Third Man Books) and Tuskaloosa Kills (Spork Press) came out this April. He lives in Ogden, Utah, where he is Assistant Professor of English at Weber State University. 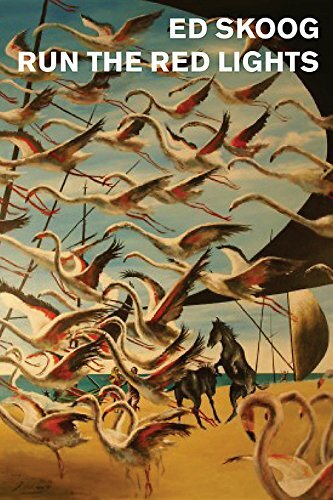 Scott McWaters has had fiction appear in Caketrain, Carolina Quarterly, New Orleans Review, NANO Fiction, Relief Quarterly, Denver Quarterly, Pindeldyboz, Madison Review, The Florida Review, Quarter After Eight, Rio Grande Review, Yemassee, among others. McWaters is an alumnus of the Capstone, as well as being in his fifteenth year as an Instructor in the English Department at the University of Alabama. Castadiva. A mental health crisis in Bel Canto. There is a reason why day time television shows are called soap OPERAS. The story lines can be heart wrenchingly romantic, side-eye preposterous, and WTF ridiculous. However, well over a century before there was a Maria la del Barrio, there was Angelina in Rossini’s La Cenerentola, and even Erica Cane's story lines pale in comparison to the absurdity of what was going on on stage during what is now referred to as opera's Bel Canto period. In this one-person, gender bending performance, Latinxs, Mario and La Castadiva, combine some of the most melodic and dramatic Bel Canto pieces to bring their audience a thoughtful but comical storyline about the mental health issues that arise when someone is just not that into you. In it's first year, the Studio Art Program at the College of Western Idaho promotes the development of artistic skills and practice, craftsmanship, and aesthetic discernment. Students graduate with an Associate Degree in Studio Arts. Through the program students are encouraged to expand their understanding of visual arts and history while learning the foundations of art in various techniques and materials. Four students from CWI's first graduating class will exhibit their work: Maelyn Palmer (Painting), Tiffany Makres (Textile/Drawing), Wendy Heaton-Storks (Painting), and Benjamin Stringham (Animation). MING Studios will host the one-night exhibition, Artifacts and Artifiction: Curating an Imaginary Life on May 8, 2018 from 6-9 pm. This exhibition is the culmination of a course held at One Stone high school in Boise this spring. Each student in this course invented a character whose life was centered on a real "historical epicenter". Through the crafting of believable artifacts that could have belonged to this person during their lifetime, the students tell their stories in the language of memories, totems, and ephemera. 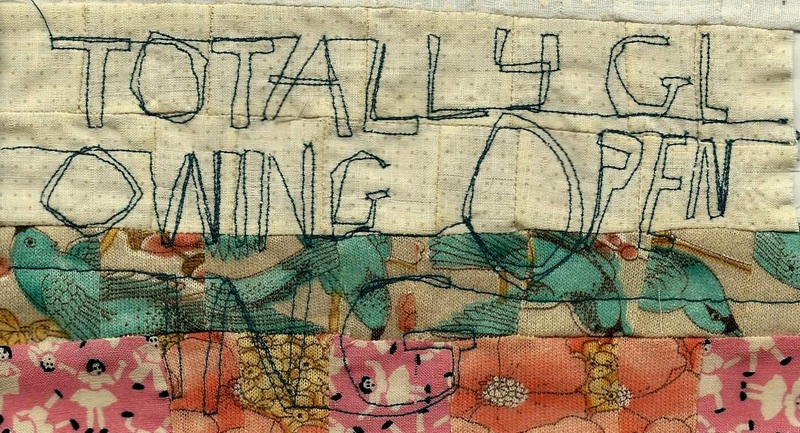 Ranging from the pressed flowers of a prairie notebook set in the 1860's, to music reviews by a rabid Metallica fan, circa 1985, the works presented by the students in this show are full esoteric detail. Join us for a transportive evening, guided by the creative effluence of these inspiring young artists. Join Boise's creative writing community in supporting first and second-year poets and fiction writers from Boise State University's MFA program. What binds us? What makes us feel as though we know someone we've never met? Makes us miss someone who's left? On Friday, May 4, MING Studios presents a trio of short films that explore connection. In one, a strong connection has been lost, leaving a feeling of being adrift. Another, a connection never able to be fulfilled due to an absence. In the last, an unlikely connection reveals an unexpected inner power and strength. Films to be screened: 'The Dragon is the Frame' by Mary Helena Clark, 'Silk Tatters' by Gina Telaroli, and 'A Million Miles Away' by Jennifer Reeder. Leftovers VIII Silent Auction benefits the Idaho Hunger Relief Task Force. The exhibition includes over 100 hand pulled prints from around the world. Now in it's 8th year, this event has exhibited internationally and premiers in Boise during May, First Thursday, 2018. "Under what conditions does newness enter the world? " Bhanu Kapil put this question to her students after the first of four intensive weekend workshops at MING Studios in the spring of this year, where poets in the BSU MFA program embarked into a poetic space within the embrace and illumination of Kapil's teaching. She writes to her students, before meeting them for the first time: "Dear poets, I do not know what will become of us but I have a deep trust in what will happen when we are together, and when we are apart. " Read the blog for this workshop as it unfolds HERE. Bhanu Kapil's sojourns in Boise will conclude with an April 20th public reading of her work at MING Studios. Poet Megan Levad returns to Boise to read from her new collection, What Have I to Say to You, which has been praised as "the kind of book one happily reads over and over," "an uninhibited and thoroughly pleasurable reading," and "a wonderful human accomplishment." A former Surel's Place Artist-in-Residence and recent MacDowell Fellow, Megan Levad is the author of Why We Live in the Dark Ages and What Have I to Say to You. Her poems have appeared in Poem-a-Day, Tin House, Granta, Fence, and the Everyman’s Library anthology Killer Verse, among other publications. Megan also writes song lyrics; her first opera, Kept, with Kristin Kuster, premiered in May 2017. Dan Lau is a Chinese American poet from Queens, New York. A Kundiman fellow, he is the recipient of scholarships and grants from The Fine Arts Work Center at Provincetown, Queer Cultural Center, and San Francisco Arts Commission. His poems have been published in Generations, Cape Cod Review, Gesture, RHINO, CRATE, Colorado Review and others. In a unique partnership with MING Studios, Boise's own 208 Ensemble will put their rehearsals on display. You are invited to explore the dynamic process of how the group brings pieces of innovative chamber music to life and sculpts them for performance. They'll deconstruct pieces, examine their elements, and put them back together. They'll discuss strategies, the way they want something to sound and feel, and why the composer wrote what they wrote. The rehearsal sessions are relaxed, visitors are welcome to come and go as they please. Feel free to ask questions, learn back stories of repertoire and composers, relax with a book, or doodle your impressions of the music. Entrance is free and open to the public. Join MING Studios in a screening of Mother, Vsevolod Pudovkin's groundbreaking 1926 feature. Along with fellow countrymen Eisenstein and Vertov, Pudovkin was an important voice in furthering film technique and theory. Synopsis of Mother: "It's the story of a woman who naively fails to understand why her beloved son is risking his life as a trade union activist in tsarist Russia. Only when he is sentenced to penal servitude does she finally realize the necessity for revolution, joining a mass demonstration against the prison." Free entrance with donations gratefully accepted. Wild West Win & You're In Poetry Slam! For the second year in a row, Boise is hosting a Win & You're In regional poetry slam! Teams from Boise, Salt Lake City, Spokane, and Oakland will compete for a guaranteed spot at the 2018 National Poetry Slam, happening in Chicago from August 13th to August 18th. This is an incredible opportunity to hear poetry (both individual and group pieces) from different cities, and support the art of slam in a regional way! MING Studios is saying goodbye to Irina Novarese's exhibition, ONE SHOT, with a daytime kid-focused activity, in addition to an evening reception. Join us between 1 & 4 PM on Saturday, January 20 at MING Studios, where we will be visualizing relationships using a spider-mapping exercise that echoes the method used by the artist in uncovering and organizing the narratives that comprise ONE SHOT. 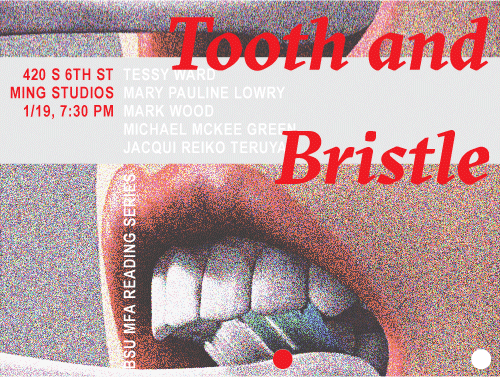 The Tooth & Bristle Reading series gives first and second-year students from Boise State's MFA in Fiction and MFA in Poetry programs the chance to share their work with Boise's literary and artistic community. Five first and second-years will read from their work. On October 31, 2017, The Cabin announced that it will be adopting the successful Ghosts & Projectors reading series for its upcoming 2017-18 season. Ghosts & Projectors is a reading series that pairs emerging, innovative, and experimental writers with writers from the Treasure Valley. Since its founding in 2011, Ghosts & Projectors has welcomed poets such as Eileen Myles, Kate Greenstreet, CA Conrad, Cathy Park Hong, and Bhanu Kapil thanks to the support of the Boise City Department of Arts & History. Under the direction of The Cabin, the series will continue to focus on bringing poets to our community as well as emerging fiction and nonfiction writers, graphic novelists, and writers that fall outside the mainstream. This season will be sponsored by Boise State University. The Cabin will launch the series with Mammother author Zachary Schomburg of Portland, Idaho author Emily Ruskovich of Idaho City, and poet Kathryn Jensen of Boise on Friday, December 8th. Tickets are $3 for Cabin members and students and $5 for the general public. MING Studios' current artist in residence Irina Novarese continues her collection of research resources with a public artist talk and participatory dialog with the Boise community. Her solo exhibition ONE SHOT, opening on November 11th, examines the fact and fiction of a historical picture taken in Idaho entitled All Female Survey Crew, dated 1918. Novarese will speak about a selection of her previous related works and the progress of her research and exhibition production thus far. Attendees will be asked to become part of the final ONE SHOT by offering their personal associations and thoughts about the historical image. From the balcony of his family’s apartment in Aleppo’s Midan district, Avo Kaprealian began chronicling daily life on the streets, capturing the sense of foreboding rapidly approaching with the violent conflict engulfing the country. Once in a while, the father breaks his silence to reprimand his son for endangering the entire family. In contrast, the mother avails herself to the camera, recounting events and divulging emotion without reserve. Midan’s residents are mainly descendants of survivors of the Armenian genocide, who fled their homes in modern-day Turkey to settle in Aleppo. As the armed conflict hits their street, Kaprealian’s lens turns inward to record the family’s quotidian life and how they cope with shelling, snipers and power cuts. For Armenian-Syrians, whose memory is deeply etched with the tragedy of forced exile, the prospect of leaving their homes and lives behind to escape death echoes like an ancestral trauma being relived. Kaprealian invokes the history of cinema to incarnate his family’s agonizing present and transforms an archive of the imaginary into one of lived experience, stitching together ruptures in modern history and providing condolence for grief. Syria/Libanon 2016 – 90 Min. AVO KAPREALIAN Born in Aleppo, Syria in 1986. He studied in the Dramaturgy and Theatrical Studies Department of the Higher Institute of Dramatic Arts in Damascus. Following his debut film, the experimental JUST TWO STEPS TOO (2012, 4 min. ), MANAZIL BELA ABWAB is Kaprealian’s first feature documentary. This film is brought to MING Studios in collaboration with KIN*K, a monthly Berlin film event curated by Irina Novarese & Marco Pezzotta. A documentary which tells two stories of compassion and civic virtue on two opposite shores of the Mediterranean, through the correspondence between Mohsen Lihidheb, a postman and intellectual in Zarzis, Tunisia, and Vicenzo Lombardo, a retired cemetery worker in Lampedusa, Italy. While searching on the beach for materials for his Museum of the Memory of the Sea – a true monument to the victims of migration – Mohsen finds a body which he decides to bury with dignity, without thinking twice about it. Vincenzo in Lampedusa shares this same sense of urgency, tending the tombs of the unknown people who he buried in the local cemetery years before. In the wake of the Arab Spring, as sea tragedies grow significantly, Irene Dionisio speaks of a potential dialogue, of deep humanity that contrasts with the obscene of current history. The screenplay won the 2012 Solinas Documentary Prize for Cinema and the SCAM Brouillon d’un rêve filmique bursary. Shores premiered at the Festival dei Popoli in Florence in 2015 where it won the Audience Award. From crop production to supermarket psychology, the work of German artist Uli Westphal investigates the origins of our food and its transformation through the food industries. Westphal is especially interested in how misconceptions and ideologies influence our perspectives on nature and consumption. MING Studios opened in 2013, with a solo exhibition by Westphal, entitled Cornucopia. Since his exhibition in Boise he has traveled to and exhibited in over 12 countries worldwide including: South Korea where he worked with local farmers, Cuba where he went fishing on a makeshift Styrofoam raft, Brazil where he met with a local chef specializing in native Amazonian species, and Czech Republic where he collaborated with the food waste activists group Zachraň jídlo. 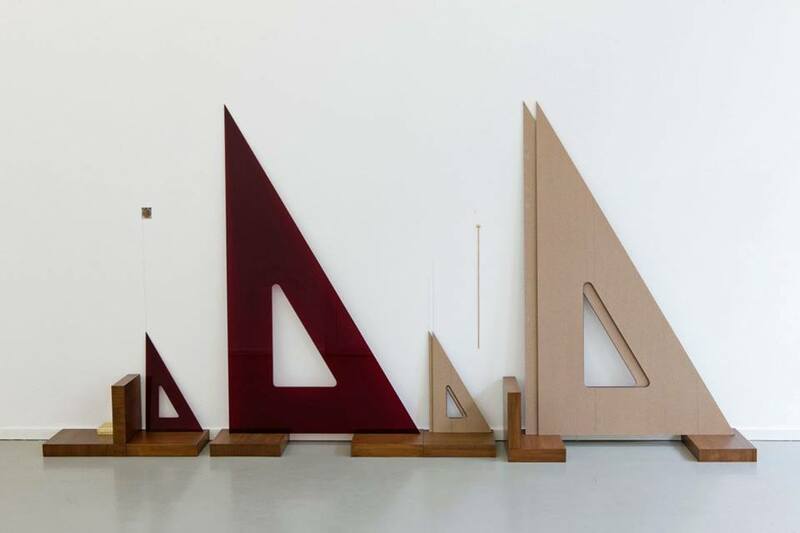 Currently, Westphal has work on view at Trapholt Museum for Modern Art & Design in Kolding, Denmark. Thursday, October 19th, Uli Westphal will to return to MING Studios to discuss previous and recent works, and share some of his experiences from working out in the field. Big Tree Arts presents a very special poetry slam & fundraising event. The poet who places 1st will win a spot on Boise's Win & You're In team, which will compete against other high profile teams from the Pacific Northwest and beyond at a competition in February. A Win & You're In is a competition in which 2 to 4 slam teams gather to compete in a four round slam. The team that places first is guaranteed a spot in the 2018 National Poetry Slam in Chicago. Throughout the evening donations will be collected to raise money for the areas affected by Hurricanes Harvey, Irma, and Maria, including a $5 cover at the door. Betsy Hinze, 'The Wondersmith' is an artist who creates free interactive events all over the Pacific Northwest. She engages with lucky strangers in unique ways, from hiding invitations in books to leaving “messages-in-a-bottle” washed up on the seashore to be discovered. Those who stumble upon her hidden invites are rewarded with a sensory experience that includes: hand-crafted serving vessels, foraged ingredients, and artful ceremony that centers around a specific theme or goal. Ephemera celebrated a collective Pacific Northwest late summer nostalgia. The guests who attended this event secured their places by gathering clues on a city-wide scavenger hunt of nostalgic places, then enjoyed an ice cream party celebrating days long past. An installation of tidepool-inspired glass and ceramic vessels set the scene. Guests foraged berries and other toppings from the vessels to top their sundaes, which featured ice cream flavors like “s’mores over a campfire.” As they ate their sundaes out of handmade shell bowls and barnacle-encrusted cups, they worked on an installation featuring poetic interpretations of their nostalgic memories. The collective installation is on view tonight for First Thursday - stop by to take part in the installation and meet the artist. 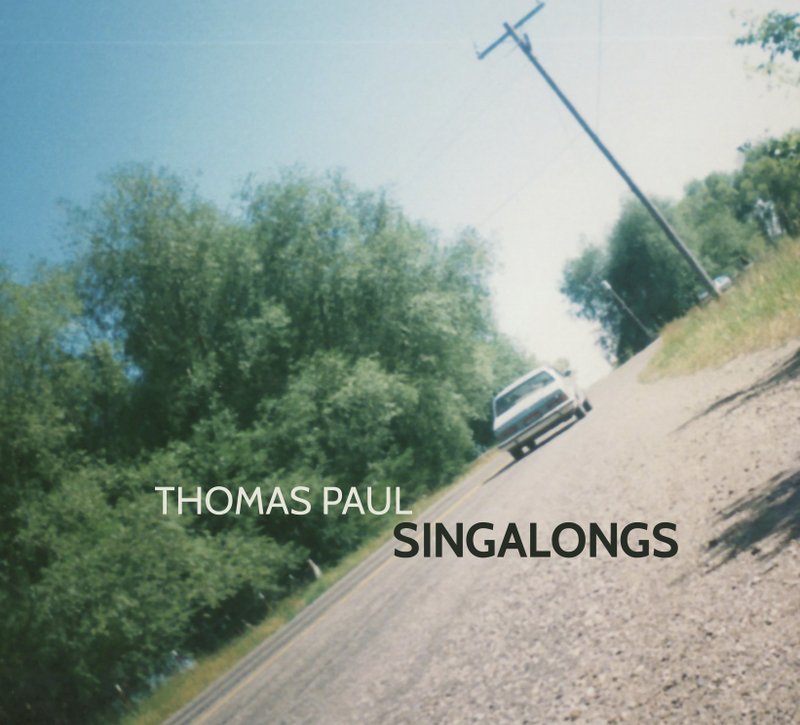 Join Thomas Paul and Friends as they present a selection of songs from his entire discography, focusing on lesser-performed deep cuts and showcasing new material. 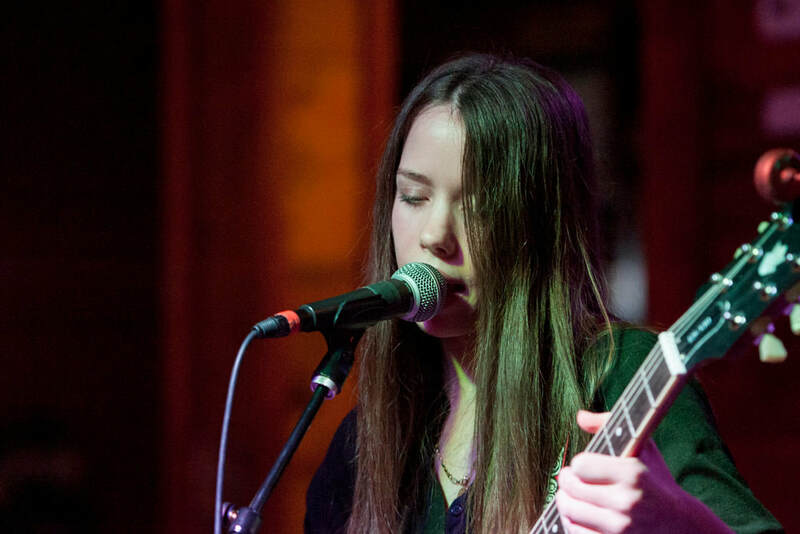 The show will begin with a set from emerging Boise folk artist Ana Lete. MING Studios is happy to announce the return of professional paper artist, Tom Bennick. 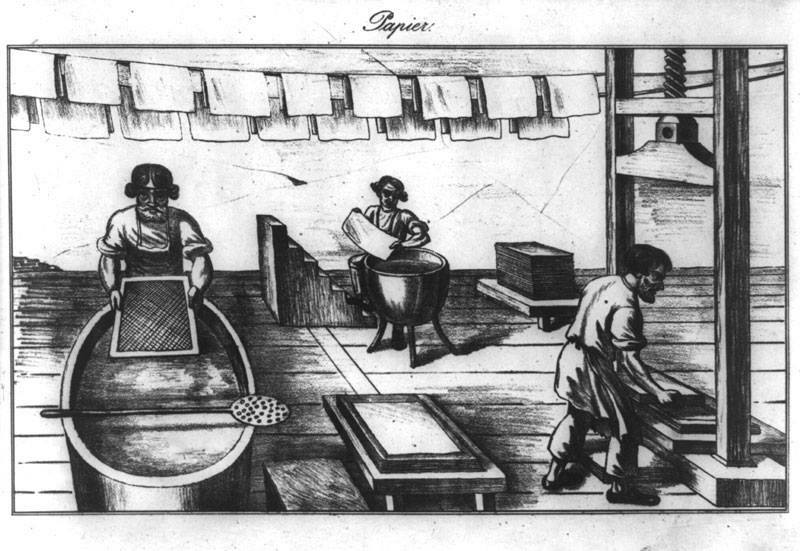 Bennick will host a new workshop focused on papermaking for fine art production. Bennick will demonstrate and explain the tools and materials used in the process of making paper, as well as, the many ways handmade paper can be applied to fine art applications, including printmaking and encaustic. 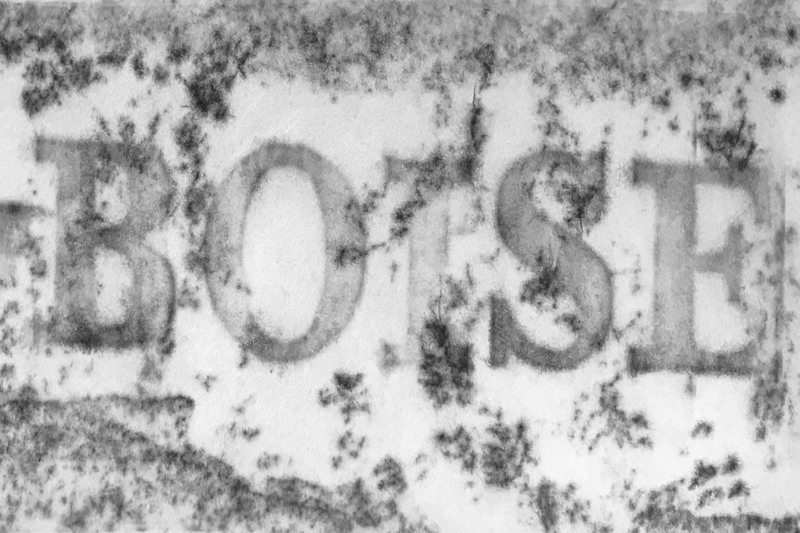 Print Boise 2017 is an installation of hand-pulled inked impressions taken from historic Boise architecture, artifacts, streets and sidewalks. Wingtip Press hosted a series of public walking tours exploring a variety of Boise’s historic sights, hearing tales of the past from city historian Amy Pence-Brown and creating the distinctive ink on paper impressions on exhibit at Ming Studios. The PRINT BOISE program is a collaboration of Wingtip Press and Preservation Idaho funded by a grant from Boise City Department of Arts and History. Local artist Bryan Moore will discuss his work, focusing on his influences, process and concepts. In addition, a short time-lapse film of the creation of his large scale work, My Fingers are Long and Beautiful, will be shown. Moore's presentation will conclude with a Q&A session with visitors. Boise Bard Players presents a streamlined, no-frills telling of William Shakespeare's comedy "Much Ado About Nothing". In this Elizabethan Romantic Comedy, when soldiers of Messina return victorious, love is in the air. The young Claudio falls for the governor, Leonato's, daughter, Hero and asks his friend and commander Don Pedro to help him win her heart. However, not everyone is interested in love. Benedick, Claudio's friend, and Beatrice, Hero's cousin, both rant against love and each other, while Don John, the conniving brother of Don Pedro, conspires to ruin the pending nuptials. 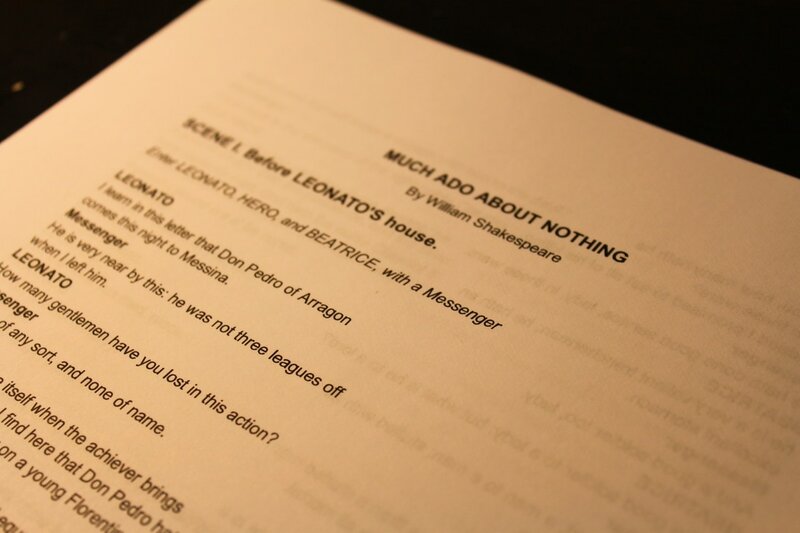 Armed with little more than Shakespeare's text and a desire to tell a story, the Boise Bard Players 12-actor cast invite your imagination to turn the blank space of MING Studios into the love-crazed world of Messina in "Much Ado About Nothing". Goran Fazil is a visual artist born in former Yugoslavia. Through his work Goran tries to question preconceived historical ideals in order to open up a dialogue with the viewer regarding our understanding of our human condition in the present. Through variety of subject matter, the main theme of war as reoccurring social phenomena is presented in Fazil’s work. Goran uses variety of mediums in order to engage the viewer. Through various contemporary approaches such as fragmentation, appropriation, installation, and recently animation, Goran creates works that challenge the viewer’s conception of the past and encourage the viewer to think of their own history and their understanding of the present. Goran currently resides in Boise and teaches at College of Western Idaho. This artist talk will follow the development of Goran's work from the past ten years in which various mediums and concepts will be discussed. Particular attention will be given to the process of animation which is present in his current work. Leftovers VII is the seventh in a series of print exchanges sponsored by Wingtip Press, a Boise based community printmaking studio. Artists from around the world produced an edition of hand pulled fine prints using “leftover” scraps of paper. One print from each edition will be auctioned off to support local nonprofit The Idaho Hunger Relief Task Force. MING Studios, International Artist in Residency Program and Contemporary Art Center, celebrates its third year with an evening filled with a variety of performances and presentations. The May 1st event will showcase local musicians, writers, and dancers. Previous MING Studios Artist in Residence, Wytske van Keulen (NL), will present her work. Amy Nack of Wingtip Press will demonstrate the printmaking technique frottage. MING Studios was founded in 2014 by Director Jason Morales, and has since hosted artists from around the world, as well as, collaborated with local creatives to produce special events and exhibitions. Join MING Studios in celebrating the start of its fourth year and the creativity of the Boise community. Wytske van Keulen (NL), Thomas Paul, Elena Tomorowitz, LED, Amanda Ranth, Jason Morales, Project Flux, Kyla Davidson, Kathleen Williams, Bronwyn Leslie, Wingtip Press, and more. That time of year has come again! Big Tree's Annual Final Slam is here and ready to blow your socks off. This will be a competitive showcase like never before, with local finalist poets competing to qualify for our National Team. Japanese Stab binding is a simple and beautiful bookbinding technique for assembling individual pages. Blank mulberry paper will be provided along with beautiful hand printed papers –or bring your own small prints, drawings or paper memorabilia to personalize your book. We will bind two books during the workshop and you will leave with materials to produce an additional book at home. We invite you to experience a workshop by Prime. It will consist of a letter form that was mostly only found in Los Angeles. 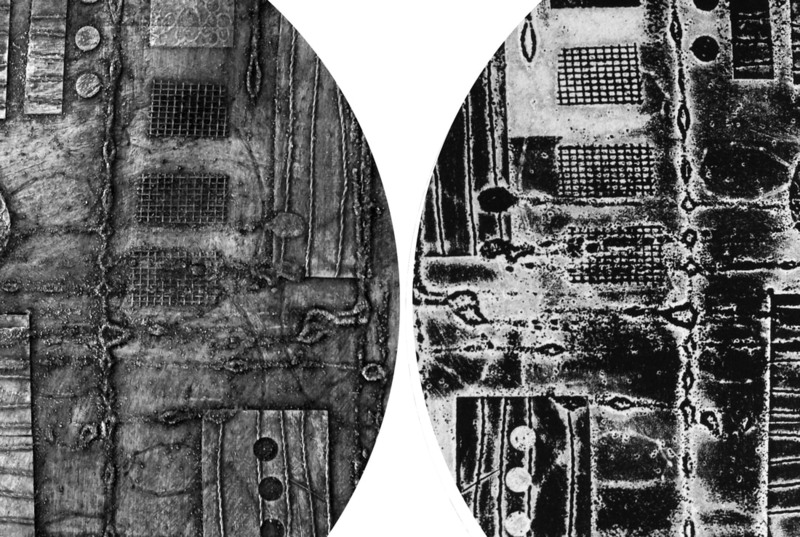 Join Wingtip Press at MING Studios for an afternoon of circular collagraph printing inspired by City Shields, one of Louise Levergneux's works currently on display in her solo exhibition Incessant Journey. Participants will create circular collagraph artwork. A collagraph print is made from a rigid surface (plate) collaged with a variety of low profile textures. The collaged plate is sealed, inked and run through an etching press as either a relief or intaglio print. Various inking, printing and registration techniques will be taught. Drawing skills are not required and the process can be enjoyed by all ages. Garth Claassen's imagery relates to arguments about the need for, or futility of, constructing border walls. His work is not a commentary on specific events or policies; instead it alludes, sometimes satirically, to the persistence throughout history of concerns with territoriality, and the perils of a siege mentality. Garth Claassen's talk will cover aspects of his work from about 2007 until the present, with an emphasis on how he arrives at and develops imagery through sketching, preliminary studies, and the process of painting or drawing. Create exquisite prints with blind-embossing and simple inking techniques on Wingtip Press’ portable etching press. Participants will craft a temporary plate using mat board, card stock, glue and X-acto knives. This versatile process can be used on its own or for creating subtle layers in a variety of your artwork. Dine amidst the art and meet the artists of this compelling exhibition. Enjoy the DJ stylings of "The Professor" Jonathan Sadler, a glass of wine, and a spectacular dinner prepared by Wild Plum. Selected exhibition pieces will be available for auction or purchase. Proceeds will support Holding What Can’t Be Held 2017. Experience slam poetry firsthand, as well as opportunities to perform your own pieces. 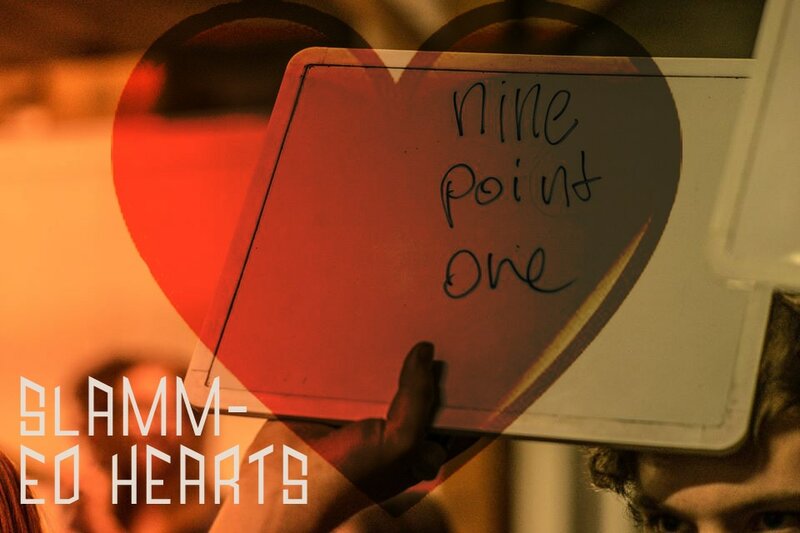 At Slammed Hearts, poets will present authentic poems headlining themes of adoration, defeat, desire, and even heartbreak. Subsequently, there will be a silent auction featuring donations from businesses in Idaho. Big Tree Arts is a local nonprofit organization that arranges events for Idaho’s literary and performance poetry community. This reading features poetry from Josh Booton, Jam Hale, Griffin Ray Birdsong, and fiction from Idaho's Fiction Laureate Christian Winn. Christian Winn is the 2016-2019 Idaho Writer in Residence. He is a fiction writer, poet, and teacher of creative writing living and working in Boise, Idaho. His work has appeared in McSweeney's, Ploughshares, Gulf Coast, The Chicago Tribune's Printer's Row Journal, and elsewhere. His debut collection, NAKED ME, is recently out from Dock Street Press who will be publishing his second collection, What's Wrong With Me is What's Wrong With You, in early 2017. Death Rattle Writers Festival is a non-profit organization dedicated to bringing the Northwest and Treasure Valley together in a joyous celebration of the literary arts in Idaho. Storyfort features events with authors from the Boise, the Northwest, and beyond, and will take place during the four days of the Treefort Music Fest, March 20-23rd, 2014. Storyfort and its events are sponsored by Boise City Department of Arts and History. The digital work of local artist Grant Olsen is composed of layers. Sometimes up to 50 layers of various color, light, and image modulators end up shaping the final image. During Olsen's artist talk at MING Studios he will uncover his digital process, layer by layer, of a single artwork. The artist welcomes viewers to ask questions throughout the duration of his presentation. 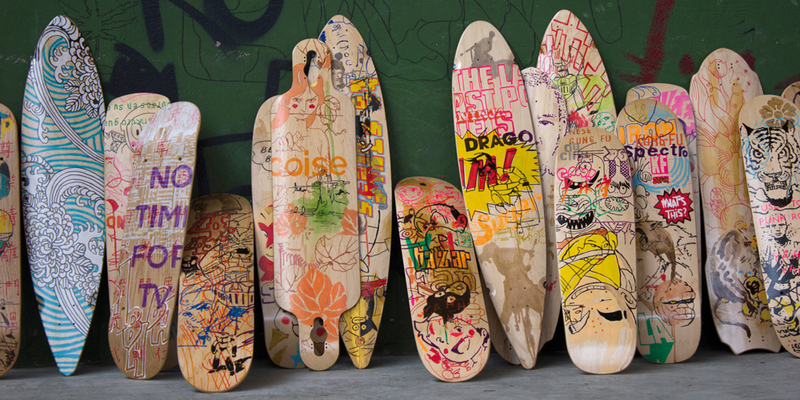 Grant Olsen's work has been shown in galleries and public spaces throughout the United States including Boise, Ketchum, Los Angeles and Manhattan. Olsen received a fellowship in Visual Arts from the State of Idaho in 2005. His work was displayed in the Boise Visual Chronicle 2002, Idaho Triennial Exhibition 2004, and the Modern Art Show 2014. In her debut poetry collection, Lydia Havens explores how mental illness, grief, and abuse have correlated in her own life, and in the patterns she observes in the rest of the world. Divided into four thematic parts, Survive Like the Water describes trauma using everyday occurrences and objects, and asks necessary questions about healing as a lifelong process. Lydia Havens is a poet currently living in Boise, Idaho. She is the co-founder and former Executive Poetry Editor of Transcendence Magazine, and the founder of Sapphic Swan Zine, a small publication for LGBT+ women and gender nonconformists. Her work has previously been published in Winter Tangerine, Drunk in a Midnight Choir, and Words Dance, among other places. 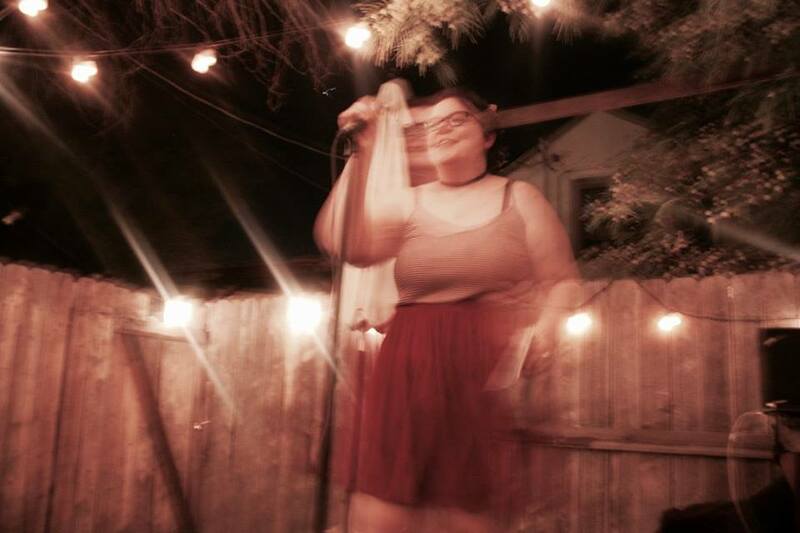 Lydia is the 2015 Women of the World Poetry Slam Youth Champion, and the author of three self-published chapbooks. Survive Like the Water, published by Rising Phoenix Press, is her first full-length collection. She currently works as a teaching artist for Big Tree Arts Inc.
On Friday, December 2nd, Ghosts and Projectors and Ming Studios present a reading by poet Ed Skoog. Currently based in Portland, OR, Ed's poems have been featured in recent issues of The New York Times Magazine, Harper's Magazine, and last year's Best American Poetry, selected by Sherman Alexie, as well as NPR––just to name a few. His third, and most recent, full-length collection, "Run The Red Lights," will be released by Copper Canyon Press in November. Joining Ed to read this evening will be local poets Diana Forgione & Colin Johnson. 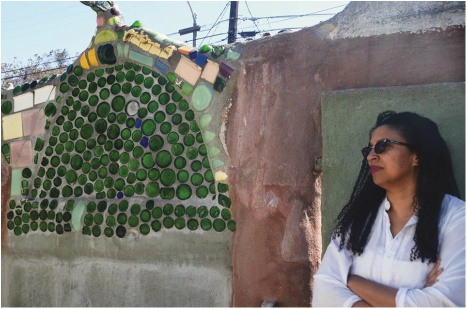 Robin Coste Lewis is an electrifying new voice in poetry whose first collection, Voyage of the Sable Venus, won the National Book Award for Poetry in 2015. Both tender and arresting in her poetry, Lewis is also an astute cultural critic, alert to the complexities of race and the black female voice. Voyage of the Sable Venus is a meditation on the black female figure through time. In the center of the collection is the title poem, “Voyage of the Sable Venus,” an amazing narrative made up entirely of titles of artworks from ancient times to the present—titles that feature or in some way comment on the black female figure in Western art. The collection presents a new understanding of biography and self and is a thrilling testament to the complexity of race—a full embrace of its pleasure and horror, in equal parts. Join Beatrice Brailsford of the Snake River Alliance for an in-depth look at our radioactive backyard. 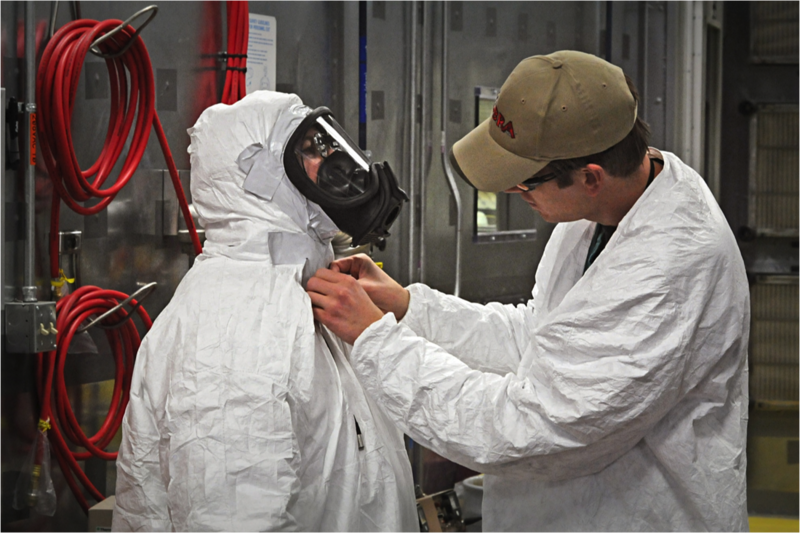 The presentation will bring you up to date on the on-going cleanup efforts at the Idaho National Laboratory (INL) as well as raise awareness among Idahoans regarding the potential threat of increased shipments of radioactive waste. The lecture will serve as an introduction to the December 17 opening of Holding What Can’t Be Held, an exhibition in which a group of eight local and international artists who have visited the INL will be presenting their work related to their experiences at the facility. Set in the harsh landscape of a burnt forest, Project Flux dancers will explore nature's cycles of life and death in their new collaborative work with multimedia artist Giuseppe Lucari and his work Contrappunto (Counterpoint). Lucari's piece brings the charred remains of wildfire to MING Studios to invoke contemplation of current events by juxtaposing nature and imitation, beauty and desolation. 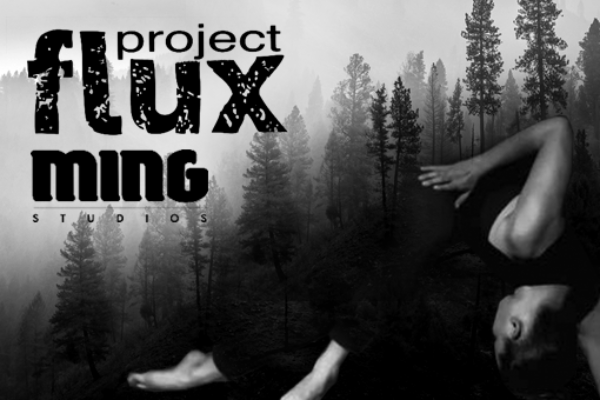 Project Flux dancers, through structured improvisation and the accompanying counterpoint music, will magnify the emotions of Lucari's work and explore its more dynamic elements. The audience will have the opportunity to become part of the collaboration through open and unstructured seating, allowing those desiring a direct connection to the work to literally place themselves within it. Join Wingtip Press at MING Studios for an afternoon of mark making inspired by “Contrappunto”, the current work from MING Artist-in-Resident Guiseppe Licari, with paper maker Tom Bennick and Cassandra Schiffler. Ashes to Abaca: Participants will be provided raw pulp and ash remnants for the use of making paper. We’ll explore techniques to produce richness by adding inclusions of remnants salvaged from the devastating Pioneer Fire used by Guiseppe Licari in his burnt forest installation. A sense of adventure and willingness to experiment is all that is required! The mystery and isolation of the woods are one of Alan Heathcock's greatest inspirations. In a unique and exciting melding of the arts, a one-time opportunity, come hear Heathcock, an internationally acclaimed author, read a story of withered woodlands and intrigue in the burned forest visual-artist Giuseppe Licari has installed in Ming Studios from trees salvaged from the Pioneer Fire. In Contrappunto (Counterpoint), Sicilian artist Giuseppe Licari addresses the rapid and tempest after effects of forest fires with a life size, site specific installation portraying the devastation of a burnt forest contrasted by the ready-made confines of the gallery setting. From the world of sports to the origins of child’s play, Helsinki-based German artist Thomas Westphal investigates the phenomenon of play and its implications on culture and society. Westphal uses a variety of artistic media to draw parallels between methods of play and human nature. His body of work surpasses the rulebooks and limitations of the playing field. The work addresses human inter-connectivity, language, and the social landscape. 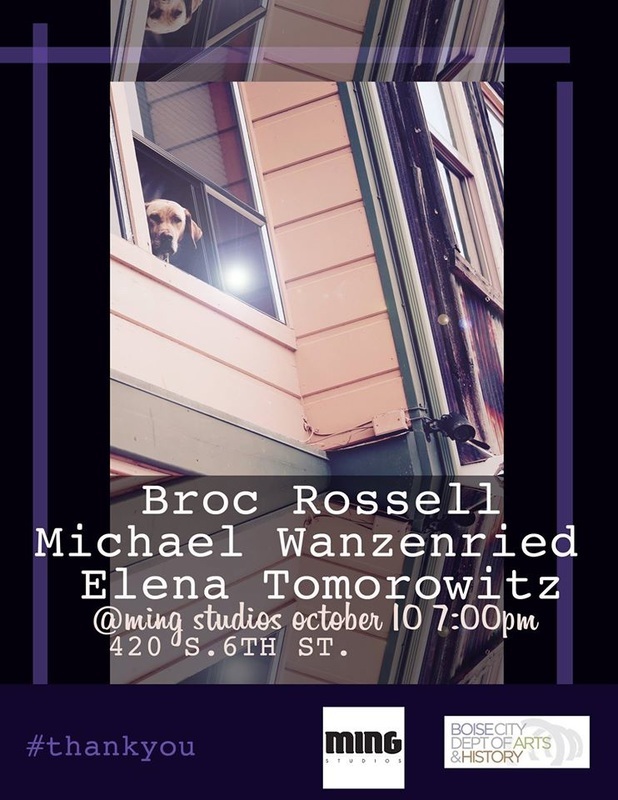 Westphal will speak about his works Dionysia, Elevated Jam, Live Wire, Yo, Bro and others at MING Studios Thursday, October 20th, 7:30PM. 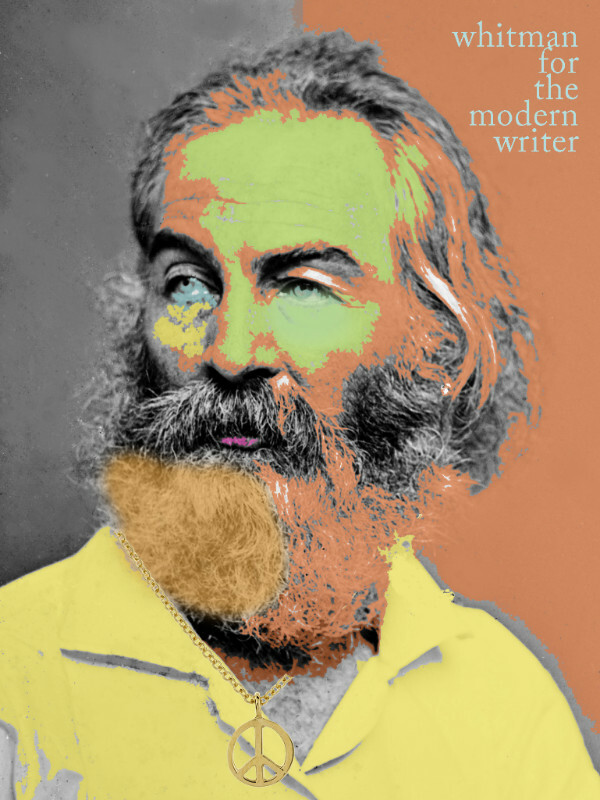 Join Elena Tomorowitz for a writing workshop to talk about Whitman, his influence on poetry through the generations, America, and how we can adapt his methods into a modern milieu. Apply these concepts and do some writing. Open to writers and non-writers! Elena Tomorowitz has a PhD in Literature and Creative Writing from The University of Southern Mississippi's Center for Writers and an MFA in poetry from Cleveland State University. She is a writer, instructor of ethics and diversity, and managing director of a nonprofit, Big Tree Arts. She lives in the mountains of Boise, Idaho. Join Wingtip Press at MING Studios for an afternoon of mark making inspired by “Contrappunto”, the current work from MING Artist-in-Residence Guiseppe Licari, with instuctor Amy Nack. Smoke Signals: Participants will be provided blank sheets of fine cotton rag paper and directed through a series of mark-making exercises using soot, smoke, fire and water to alter the paper. We’ll explore layering techniques to produce surface richness and a range of value. Sign your favorite piece from the day and we’ll make it frame-ready for you by dry mounting it to reclaimed paperboard. We’ll also collaborate to create a larger piece to commemorate the workshop. A sense of adventure and willingness to experiment is all that is required! 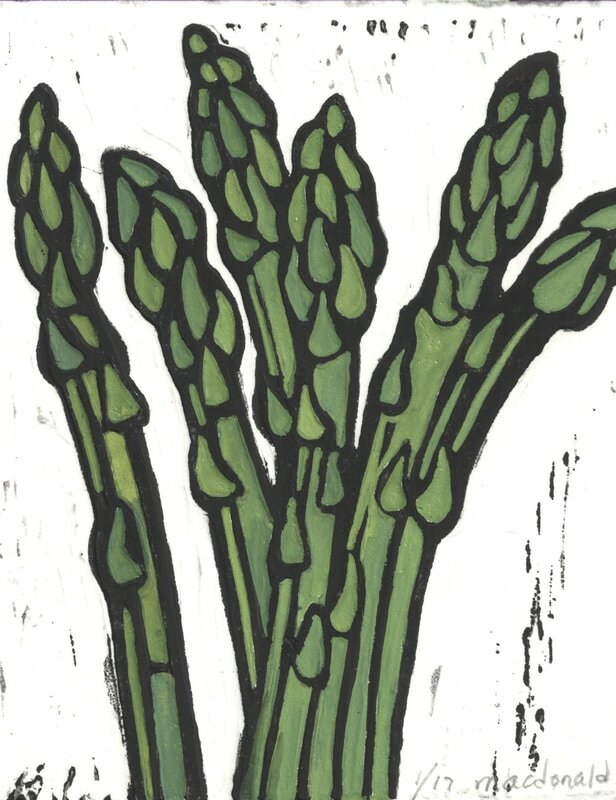 Join us at Ming Studios for an afternoon of printmaking inspired by “Contrappunto”, the current work from Ming Artist-in-Resident Guiseppe Licari. Charred Impressions: Markmaking and the Landscape of Wildland Fire taught by instructor Amy Nack of Wingtip Press. Wildland forest fires impact the beauty and harmony of our landscape. In this workshop we will create impressions of natural and manmade artifacts to represent our own relationship to the burning of Idaho forests using ink on paper and fabric. *Participants are encouraged to bring objects for creating impressions. Workshop participants can also take home their final products once the workshop is complete. MING Studios' current Artist in Residence, Sicilian artist Giuseppe Licari, will speak about his previous work, including his most recent project and publication Schlak, which took place in Luxembourg. Licari's work addresses and re-configures the relationship between the man-made environment and natural landscapes through site-specific installations, public interventions, and performances. While in Boise, Licari will develop new work for his upcoming solo exhibition Contrappunto, a timely installation that spotlights the giant wild fires that rampage the northwest. This project & cultural exchange was made possible thanks to the generous support of Centrum Beeldende Kunst Rotterdam and the Boise City Department of Arts & History. 208 ensemble introduces its third concert season with contemporary chamber music celebrating the National Parks Service. This concert features music by David Biedenbender, Alex Shapiro, John Luther Adams, and Mason Bates that was written for or inspired by the landscape of the American West. Created in 2014 by cellist Jake Saunders and composer David Biedenbender, 208 ensemble brings progressive chamber music by some of the most innovative composers writing today to Boise, Idaho. Its members are dedicated to cultivating enthusiasm in Boise for a brand of music that exists where the refinement of classical performance meets the visceral energy of a rock concert. 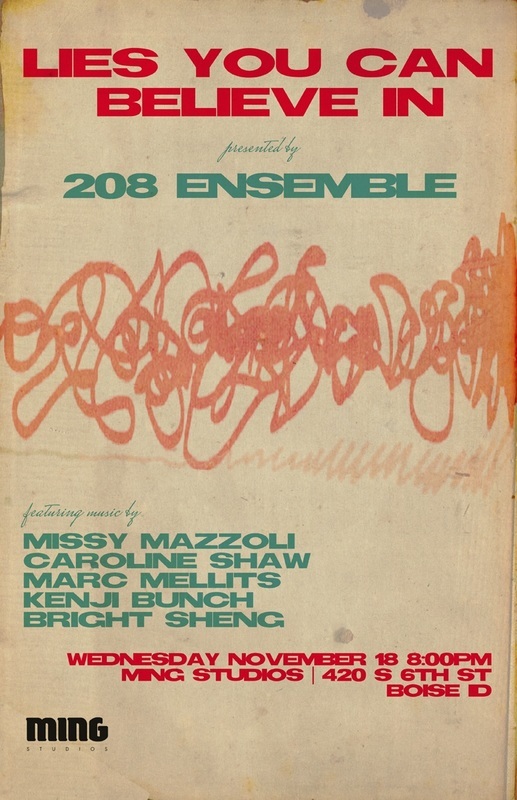 208 ensemble is a dynamic, multi-instrumental contemporary music ensemble. Cellist Jake Saunders, violinists Geoffrey Hill and Kate Jarvis, violist Emily Jones, and pianist Betsi Hodges represent some of the highest caliber classical musicians in Idaho. These core members have received training from top institutions throughout the country, and currently serve principal positions in the Boise Philharmonic Orchestra, the Opera Idaho orchestra, and contribute regularly to the Boise Baroque Orchestra, LED, Classical Revolution: Boise, and the Boise Philharmonic String Quartet. 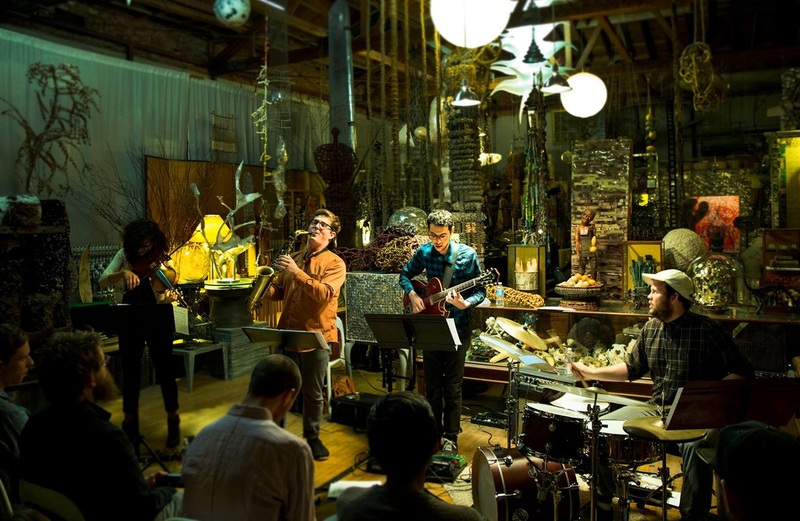 Since its debut in November 2014, 208 ensemble has been a featured artist at Treefort Music Fest 2015 and 2016, and has presented featured programs at the Sapphire Room, MING Studios, RadioBoise, Cinder Wines, and the Morrison Center for the Performing Arts. 208 ensemble frequently collaborates with local artists, including Dr. Linda Kline Lamar, Jeffrey Barker, Thomas Paul, Brian Vance, Lindsay Edwards, Matthew Tutsky, and Bill Kloppenburg. In February 2015, the ensemble shared the stage with international touring artist Emily Wells. For beginning to intermediate writers, this workshop draws on the primal elements in which Horror Fiction percolates within the human condition. Diana Forgione will navigate writers in through the three archetype genres utilized to create a foreboding atmosphere. Writers will be introduced to techniques and exercise reflecting their own instincts in the environment of the unknown. Diana Forgione is the co-founder, host, and organizer of the Death Rattle Writers Festival, a freelance writer and poet, and a judge and workshop instructor for the Scholastic Art and Writing Awards. She has an MFA in creative writing, is a member of the Writers Guild of America and performs her poetry at literary events across Idaho. She is currently refining an anthology of poetry for publication. HGT’s summer cult-­‐classic returns! A last hurrah backpacking trip goes awry for four friends when a mysterious treasure map surfaces, catapulting them into an adventure chock full of mysterious creatures, powerful magic, and a PBR-­‐swilling mountain woman, the four friends must learn to live together or die alone. A raucous celebration of friendship, family, growing up, and sprites. As part of her exhibition Wytske van Keulen has organized an evening with Movies and Soup, presenting films by Dutch photographer and filmmaker Ed van der Elsken and French artist Naïmé Perrette. Though produced in different times, respectively 1972 and 2016, both films, in their own way, show a personal portrait of extraordinary individuals. MING Studios is pleased to invite you to a unique dinner experience as Wytske van Keulen's exhibition 'Not Somewhere Else, But Here' comes to a close. MING Studios has partnered with their friends at Wild Plum to host this event. Wild Plum specializes in local, seasonal and organic foods prepared from scratch. The setting of the dinner will be intimate, the conversation personal, and the food delectable. MING Studios would be delighted to have you share this evening with us! Thomas Paul is a composer, multi-instrumentalist, vocalist and songwriter from Boise, Idaho. Regarded as one of the region’s most versatile, gifted musicians, Paul’s output as a bandleader/solo artist and in-demand sideman and session performer covers a wide range of genres, including garage rock, lounge blues, alt-country and folk. Concert featuring collective record label roster artists Yardsss (Portland) and Wrtch (Chicago). Experimental, orchestral noise & audio/visual performances. As part of the exhibition Wytske van Keulen will organize an evening with Movies and Soup, presenting films by Dutch photographer and filmmaker Ed van der Elsken and French artist Naïmé Perrette. Though produced in different times, respectively 1972 and 2016, both films, in their own way, show a personal portrait of extraordinary individuals. Death in Port Jackson Hotel is a film portrait of the Australian artist Vali Myers. Van der Elsken got acquainted with her in post-war Paris. His pictures of her resulted in the pictorial history A love affair in Saint-Germain-des-Prés. Eighteen years later Vali pays a visit to the photographer on his farm in Edam. Van der Elsken films her while she brings back memories looking at photographs that are shown to her. She talks about OD victims, suicides and her opium addiction. He also films her in his kitchen while she is making the drawing Death in the Port Jackson Hotel. And finally he films her in a valley near Naples, where she leads a secluded life with her 19-year-old boyfriend. The preview film by Naïmé Perrette portrays James McCullough, a young painter active as a musician in the Melbourne punk scene. He works night shifts as an undertaker, removing corpses and delivering them to the Forensic Mortuary. The film looks at the way the different aspects of his life affect each other, questioning the balance between control and vulnerability. The daily presence of the camera in his house reveals his identity by engaging him in a constant shift between a performative attitude and self-reflexive moments. His sensitive observations of the unclothed corpses he handles echo his own feelings of being probed by the filmmaker. Preston Swirnoff San Diego-based musician and composer Preston Swirnoff will play music from his new solo project ‘Haunted Sea Songs of Bahia’ - dark, eerie Brazilian folk ballads about the power of the ocean, disappearing fishermen, and lost love. Features versions of songs from the 1940’s by the legendary Dorival Caymmi, played on classical guitar and sung in Portuguese, along with Swirnoff’s instrumental originals. Preston’s background in punk, acid folk, and midnight jazz all come through in these mesmerizing, otherworldly sea shanties. The album will be released in 3 volumes on vinyl/digital beginning May 2016. Part love letter to Vita Sackville-West, part exploration of the art of biography, ORLANDO is one of Woolf's most popular and recognizable works, the fantastical biography of a poet who first appears as a 16-year old boy at the court of Queen Elizabeth I, and who by the end is a married woman in the 20th Century. Sarah Ruhl's adaptation lifts right from the novel's text and mixes Woolf's prose with Ruhl's musically tinted style, presenting a delicious romp through gender, love and time. Leftovers VI is the sixth in a series of print exchanges sponsored by Wingtip Press, a Boise based community printmaking studio. Artists from around the world produced an edition of prints using “leftover” scraps of printmaking paper to be auctioned off at the Leftovers silent auction. Proceeds will benefit local nonprofit The Idaho Hunger Relief Task Force. Project Flux and MING Studios celebrate their second collaboration, this time inspired by MING's February installment: The Museum of Broken Relationships. 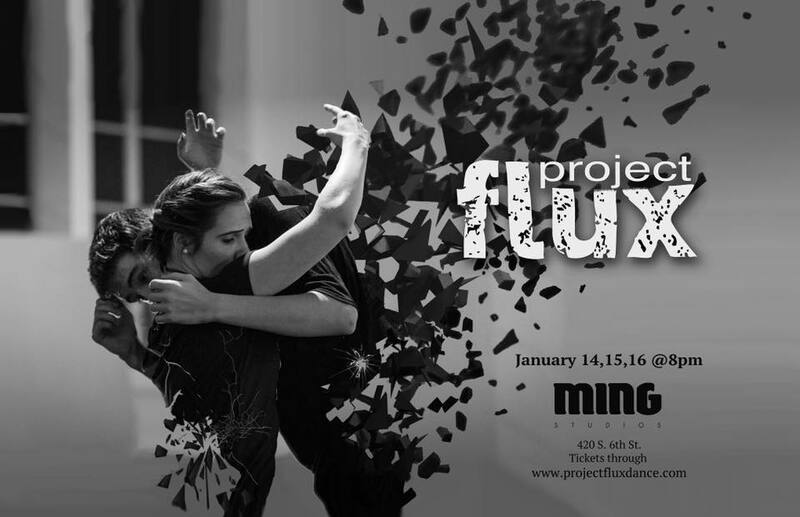 Join Project Flux dancers Lydia Sakolsky-Basquill, Bayley Brooks, Selby Jenkins, Evan Stevens, and Jem Wierenga as they transform the space January 14-16, 2016. Frankly Frankie Productions is proud to present the one man play, Tru, written by Jay Presson Allen, produced by special arrangement with Samuel French. Staring Adam Toothaker as Truman Capote and directed by Anne McDonald, Tru will play at MING Studios January 6-8. Tru offers a glimpse into the narcissistic existence of Truman Capote as he wrestles with the consequences and social backlash of high society from his published words. Adam Toothaker and Anne McDonald first collaborated on Samuel Beckett’s, An Act Without Words in 2013. Adam received his MFA in performance at UC Davis. Anne earned her BA in Theater at Boise State. She is a founding member of the Red Light Variety Show and the driving force behind Frankly Burlesque. This is her directorial debut and the first non-burlesque show under her production company, Frankly Frankie Productions. Tru is their second collaboration. Tickets: $10 pre-sale or $15 at the door. Tooth and Bristle is a reading series curated by the Boise State MFA program featuring current and past students of the program. Sam Campbell, Nolan Turner, Timmy Griffith, and Ashley Barr will read. November is Epilepsy Awareness Month. MING Studios welcomes The Epilepsy Foundation of Idaho, who will host an art workshop to raise awareness of the condition affecting 1 in 100 adults, and 1 in 20 children. 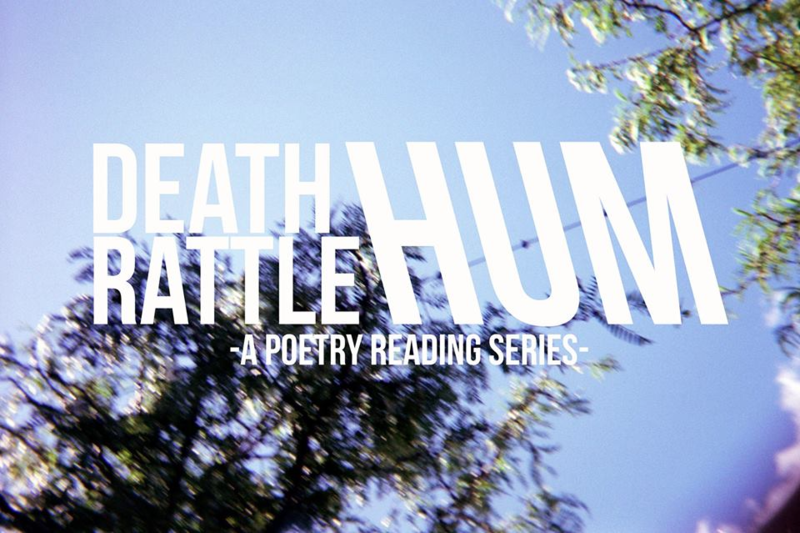 The inaugural reading of Death Rattle Writers Festival's new reading series called 'Death Rattle Hum' features Joshua Walters and Nora Cooper. Los Angeles based artist Amanda Ross-Ho works in painting, drawing, sculpture, photography and installation. Ross-Ho’s work has been shown in major museums including the Museum of Modern Art in New York and The Museum of Contemporary Art, Chicago. She was included in the 2008 Whitney Biennial at the Whitney Museum of American Art, New York. Please join us for this great opportunity to see and hear Amanda Ross –Ho talk about her work. From Black-eyed Susans to Maple Tree Leaves and RabbitBrush Blossoms, learn to use local dye plants to produce natural dye colors. MING Studios’ current artists in residence, Kathrin Niemann and Kristen Cooper, will demonstrate how to extract dye from plant material and introduce a variety of dyeing techniques, such as, eco-printing, painting with natural dyes, and Shibori (an ancient Japanese method of folding and clamping fabric to make patterns). Learn how to pre-treat vegetable and animal fibers for dyeing, and how various mordants and modifiers alter plant color. 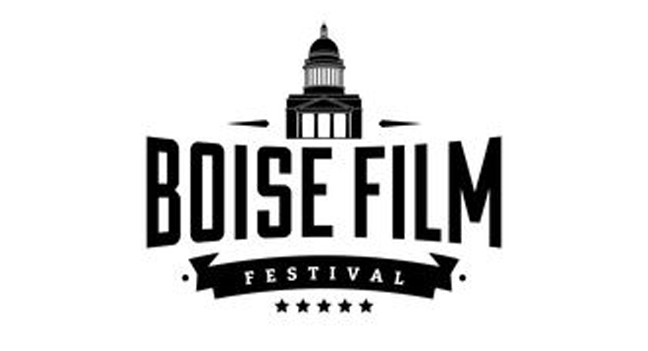 Boise Film Festival was established to celebrate films from around the world. The festival offers a platform for international artists, as well as Idaho natives, to showcase their talents, and serve as a new portal for rising talent. When life repeats itself, we'll do anything to change our destiny. We'll toil and sacrifice for our families, without asking the cost on our children. 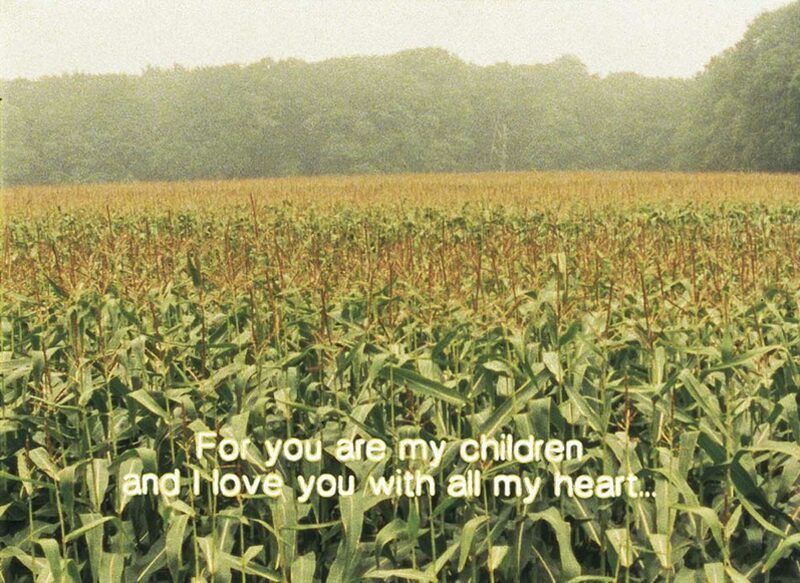 To support his family in the Basque Country, Joaquin must herd sheep alone in America. Burning suns and blistering winds have made him a quiet, distant man. When his son joins him herding, years of separation and sacrifice come to a head. Together, they must battle the mountains,isolation, and each other. The first American-made Basque-language film, Zuretzako is based on the life of filmmaker and Princess Grace Award-Winner Javi Zubizarreta's own grandfather. Starring Zubizarreta's father and brother in the title roles, Zuretzako tells the story of the sacrifices that fathers make and the toll they take on their sons. Basque artist Judas Arrieta is MING Studios’ current artist in residence. 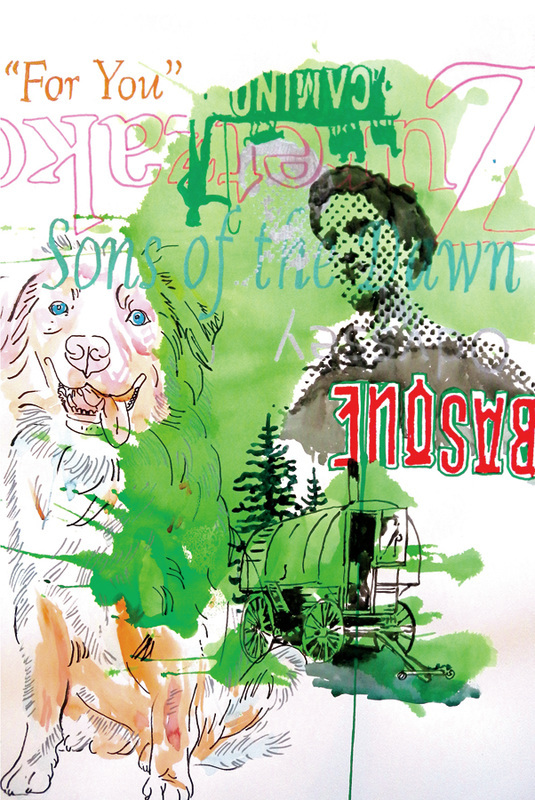 His solo exhibition Boiseland opens July 24th, coinciding with Boise’s 2015 Jaialdi Festival. The title Boiseland refers to the status Boise holds in Basque Country. Having grown up in Euskal Herria, Arrieta understood Boise as a legendary place forged by pioneers. He was told stories of shepherds and lonely farmers who roamed boundless green meadows, climbed huge cliffs and crossed wild mountains. As Arrieta blatantly puts it, ''For any self-respecting Basque, Boise, Idaho, is a place of history and encounter, an almost mythical place, a kind of Basque Atlantis that you need to visit before you die.'' In Boiseland, Arrieta takes us all on a journey to a parallel reality, creating an alternative representation of Boise where legends ``live together´´ with the mix of experiences he encounters during his residency. Colera - dir. by Aritz Moreno / Hubert Le Blonen asken hegaldia - dir. Zarautzen erosi zuen - dir. by Aitor Arregi - 16 min. The project, Holding What Can’t Be Held, asks viewers to step inside a paradox. Located outside Idaho Falls, on the ancestral lands of the Shoshone Bannock tribes, and directly above the Snake River Aquifer, the INL is rich in material for contemplation. After all, how do you hold what can’t be held? How do you tell a story that will last a hundred thousand years? 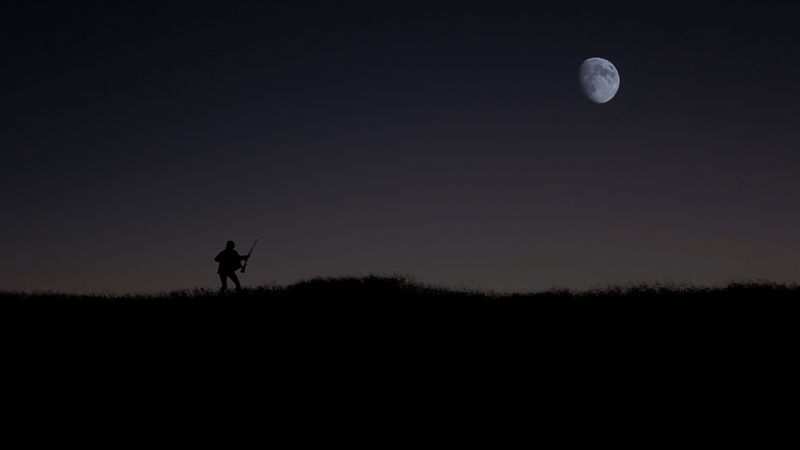 For the Closing Reception, MING Studios will host a second screening of the short film "Mercury" by local Boise filmmaker Zach Voss, and host live music performance by special guests (to be announced). ﻿﻿﻿﻿﻿The Idaho National Lab (INL) was established in 1949 and covers 890 square miles of eastern Idaho’s high desert plain, one of the most beautiful parts of our state. 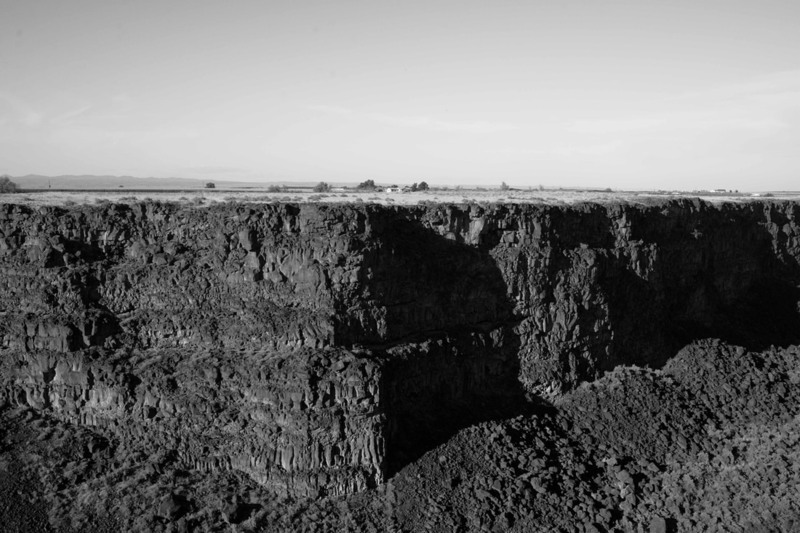 Beneath it, sixty years of nuclear contamination threatens the sole source of drinking water for 300,000 Idahoans downstream. Hazards have been created and accumulated and are now being cleaned up. It’s a story, filled with juxtapositions, that can be told in many different ways and from many different perspectives. Personal journeys through the nuclear complex: a chance to share. In October 2014, the Snake River Alliance invited visual artists to join our tour of the environmental cleanup projects at the INL. The artists came from across southern Idaho. Some were fairly familiar with the US nuclear weapons complex, while others learned they lived near an almost alien place. None left untouched. Out of that long, challenging day, they have produced works of art probing the beauty and the peril of what they saw. For this Open Discussion, Snake River Alliance and MING Studios invites Artists and Community members to share their experience and process. Join LED at Ming Studios for an informal preview of their newest work, "Barbarian Princess", before they take it on tour to Seattle and Portland. 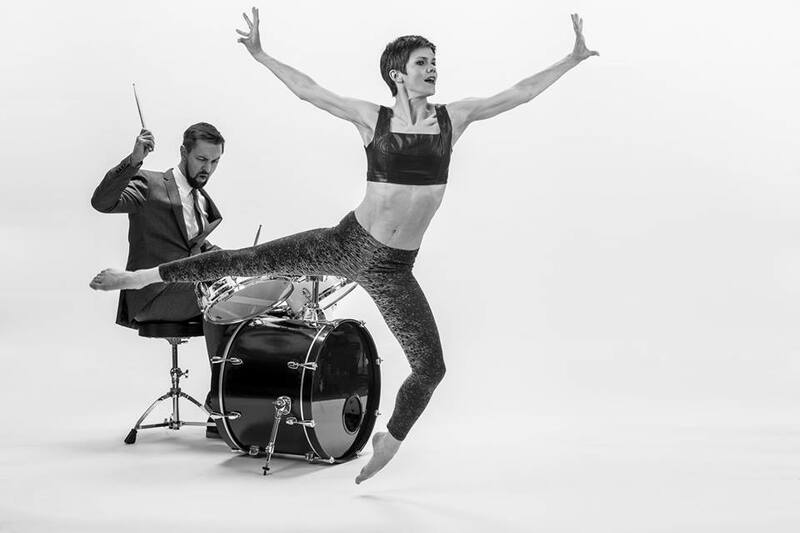 "Barbarian Princess" features live music (Andrew Stensaas), dance (Lauren Edson), projections (Kyle Morck) and is inspired by the writings and biography of Zelda Fitzgerald, the wife of famed American writer F. Scott Fitzgerald. 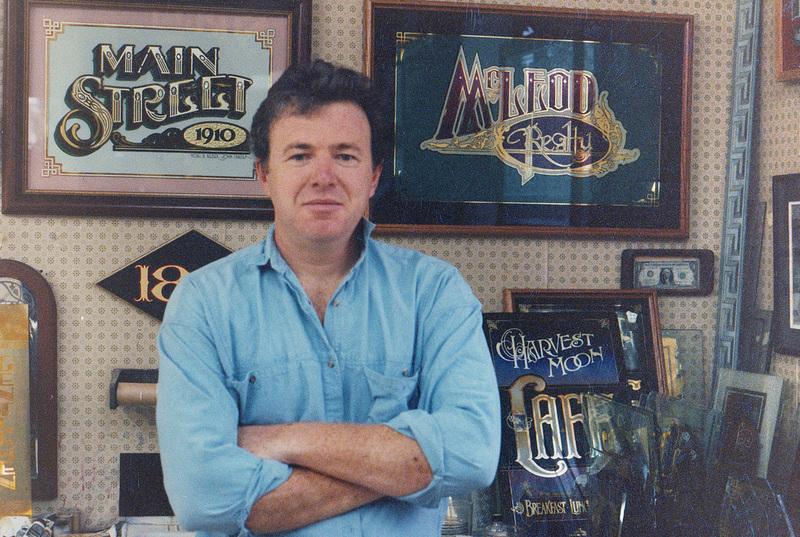 work of Master Sign Painter, Noel Weber. Opening reception February 5, 5:00-9:00 pm. Noel will guide a virtual tour of Downtown Boise, sharing photos and the historic context of his work over the last 35 years. Participants will have an opportunity to reflect upon Boise's changing landscape and to inquire about the menagerie of establishments and people who have grown with it. Noel Weber provides a presentation on hand lettering, demonstrating three type styles: Spincerean Script, Copper Plate, and Convexed Letter. Doors open at 6pm, February 20th, with music from Slow Space @ 7pm, Bijoux @ 8, and With Child @9pm. Project Flux presents ''You___not_____.'' 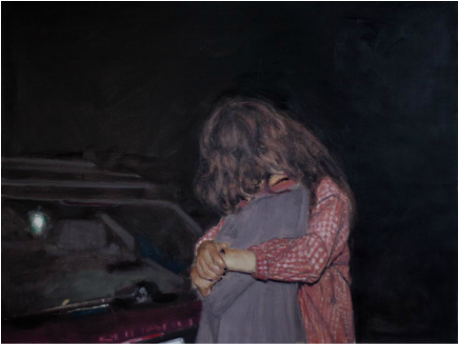 This new work is based off of one simple concept: the hug. MING Studios is pleased to announce a special one night only, First Thursday Event: 5 short films by international artist Katarina Zdjelar. This selection of short films by Katarina Zdjelar functions as an introduction to the artists intriguing video work. They provide insights into the artist’s careful observations of human behavior and her research into the role of language in human relations. Katarina Zdjelar’s audiovisual work draws upon language and voice as a means to render portrayals of identity, and community under a broad notion of contemporary culture. The characters in her films are placed in preexisting situations or foreign scenarios. She exposes vulnerabilities, which arise from loss of ownership of personal voice and individuality. June 4, 2014 Westphal leads a guided walk through of Cornucopia, while giving insight into his process, inspirations, and other works. A group exhibition in collaboration with the Snake River Alliance. An exhibition of site-specific works that focus on the radioactive "clean-up" sites at the Idaho National Laboratory. Aventurine is the musical performance project of Rachel Hays. Originally from Boise, she is now based in Brooklyn. After debuting at SXSW earlier this year Aventurine has been playing interactive shows exploring narrative in a variety of mediums. At MING Studios she will present an interactive comic songbook. MING Studios resident artist Marijn van Kreij presents two evenings of international films and local music. First screening at 6:30PM with films from Dutch artist Jeroen Eisinga. At 7pm Boise's own 208 ensemble will play. At 8pm a film from British artist Rory Pilgrim. 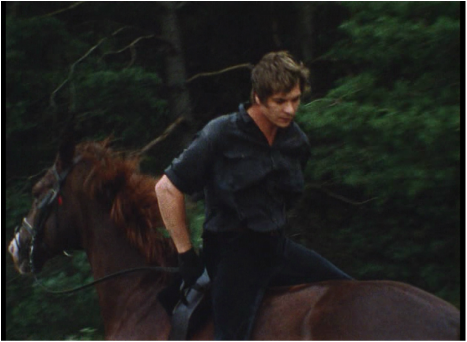 First screening at 6:30 with films from Dutch artist Erik Wesselo and French artist Laure Prouvost. At 7pm music from Bijoux & Lionsweb. 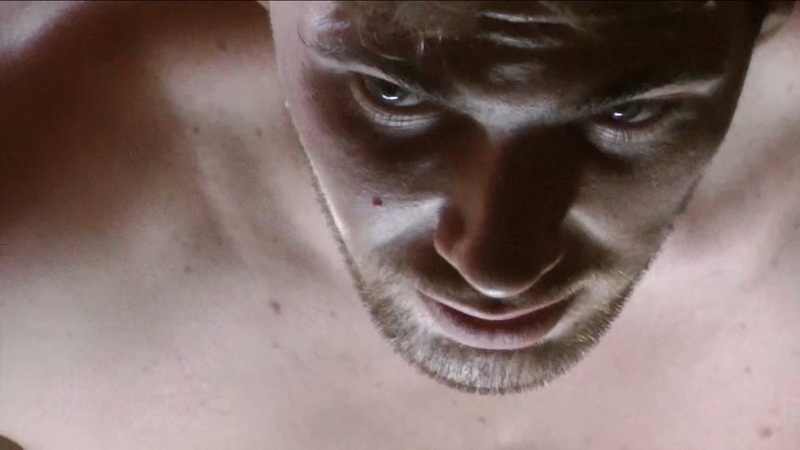 At 8pm, screenings continue with more shorts from Wesselo & Prouvost. Ghosts & Projectors. a poetry reading series. will host a reading featuring Jane Wong of Seattle, WA at MING Studios, on February 28th at 8:00PM. Sharli Turner and Cheryl Maddalena of Boise will also read. Street artist AXEL VOID continues his long-time creative involvement with everyday people in his solo exhibition Mediocre: Rocio & Sofia. The new body of work he presents –painting and video- takes inspiration from the everyday lives of two teenage girls living in Boise. First Thursday - October 2014: Ryan Hadden Thursday, October 2, 2014, 5-9pm Local Boise Author and Illustrator, Ryan Hadden, exhibits illustrative and poetic works from his newly completed series of children's books. Finding the Michaels A One-Woman Show by Cassie Angley September 11-13, 2014, 7pm daily When your world explodes - literally - it's time to rewrite your story. Cassie realizes this on 9/11, when she's suddenly propelled on a quest to find her father, Michael. She finds a trail of Michaels, both dead and alive. Portraying nine characters, she musters the humor and courage to piece together their fractured stories in, Finding the Michaels, this inspiring solo play based on the playwright's true story.